With Easter Sunday approaching in a couple of weeks, these cute Easter basket ideas are sure to add a sweet little touch to your holiday celebration. From Easter baskets for kids to personalized Easter baskets, these Easter ideas are sure to get you inspired! With Easter just around the corner, I am having so much fun putting together Easter basket ideas for creating sweet memories! Every year, one of my absolute favorite things about being a mom is putting together Easter baskets for the kids. It brings me so much joy! And I just love to watch them smile ear to ear as they hunt through the house for special Easter eggs and collect them in their baskets. I also love putting together spring surprises for my mom, my best girlfriends, and even the office at Charlie’s school! Who says Easter baskets are only for kids?! I’m so excited to share a few Easter basket ideas with you for inspiration, adding such a special personal touch to the holiday. Who will be getting a special Easter basket from you this year?! This Floral Basket is so cute! I can’t wait to fill these baskets with special cookies and candies for my neighbors and friends as a sweet surprise. And the best part?! It’s only TWO dollars! This Pink Chipwood Basket is so sweet for little girls! If you look closely, you’ll see adorable chicks and eggs in the design. I’m obsessed! Robin’s egg blue is such a fun color to incorporate for Easter and spring. I’m loving this Blue Chipwood Basket for the boys on my list. You can’t have Easter without florals, right? This Floral WIllow Basket really embraces the pastel floral theme. Just imagine the kids looking for eggs with this basket in their hands, so cute! If you already have a basket, but you just want to dress it up a little, this Bunny Basket Charm will do the trick! Or, even add it to a special gift for a loved one. I just love putting together special gifts for loved ones. But you know you can’t put together an Easter basket without a little Pink Easter Grass! Look at this Pink Bunny Basket! The pink liner comes personalized to make Easter even more special. How cute is that?! This Taupe Bunny Basket liner would be such a special touch for your child’s basket. And I adore the fact that you can customize the ears to really create heartfelt memories! You know me and my love affair with gingham! I’m obsessed with the colors on this Gingham Basket, and I bet Charlie will be too! Surprise a friend with a spring-inspired basket filled with their favorite chocolates and other small items. This Pink Pom Pom Basket would be so fun to give as a special gift! This Embroidered Bunnies Basket has the cutest green gingham bows, paired with navy and white. 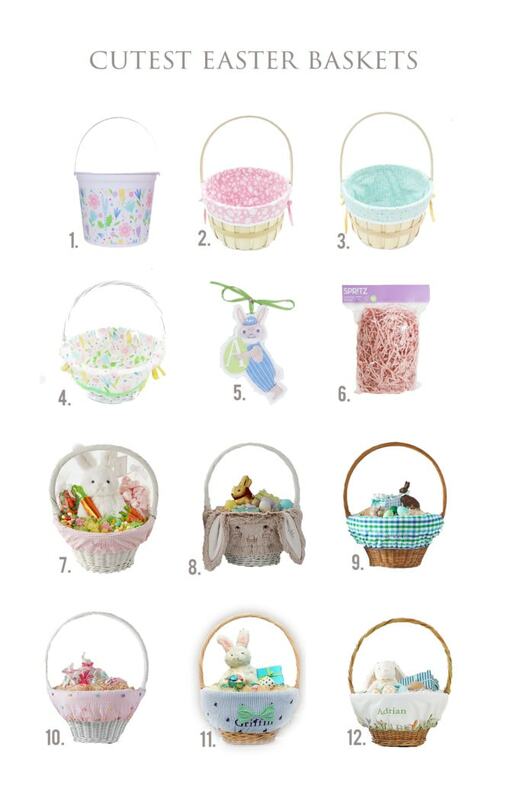 Plus, the option to create a personalized Easter basket! This Peter Rabbit Basket liner has such beautiful embroidery all around the edge. The design brings back so many memories of reading to the kids, and I love the idea of incorporating it into Easter to make even more special memories! I hope you’re feeling some spring and Easter inspiration with these Easter basket ideas! They are such a simple way to liven up the holiday with bright pastel colors. Leave a comment and tell me what you plan to do for Easter baskets this year? I can’t wait to hear your Easter ideas!